Cloud based services including quick and efficient delivery of digital Mobile Coupons have seen significant increases recently mainly due to the market saturation of smartphones. Most Americans view themselves as green or at least they like to make to choice of paperless when presented with the option. We can help your business get setup to deliver mobile coupons from your website or other online sites including social media pages. Give your first time visitors another reason to try you over the competition with instant delivery offers. Once they choose to get your special offer/digital coupon sent to their phone your special offer will be waiting in their text message in box so they won’t forget about you once they leave your website. Contact us at 952-985-5525 today for more information. Click this link for a demo. 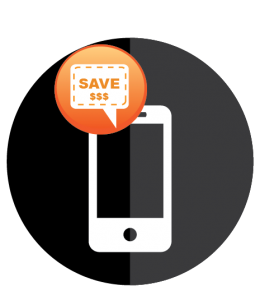 Who can benefit from Mobile Coupons? Businesses that benefit the most from utilizing mobile sms delivery services are mainly in the service related type of business. It’s a great platform to deliver your mobile app direct to consumers. Restaurants, automotive, sporting good stores and other retail stores are some excellent examples.